Take a look at 21 gorgeous nail art designs ideal for festive occasions such as Rakhi! We are just a week away from the Hindu festival – Raksha Bandhan. On this auspicious day which is widely celebrated across India and around the globe, sisters tie a sacred thread known as Rakhi on the wrist of their brothers and pray for their long life. In return, they get blessings and gifts. This day also happens to be a sort of a get-together where families unite, so obviously it gives all the ladies a reason to look just the best. An ethnic or Indo-western outfit, monsoon inspired hairstyle, natural or light makeup (because Raksha Bandhan is mainly a day-time affair) is all that one needs to look gorgeous on this day. Besides, this time, we are encouraging all the married and unmarried sisters to also sport a beautiful nail art design. Inspired by the colors, festivity fervor, and the weather, this year opt for any of these nail art designs for an ultimate embellished look for the entire week leading up to Rakhi. One of the most embellished nail art designs, the use of rhinestones, gems, pearls, crystals and studs make for sparkling nails. You will have to largely depend on the supplies such as rhinestones, gems, pearls and studs which are available in the market. Opt for the colors and sizes that suit your personality and nail shape. You can also glue them on your freshly manicured nails. So, this Rakhi, wear nail gems in a simple way. Adding a single stone to each French manicured nail adds some sparkle without being over the top. 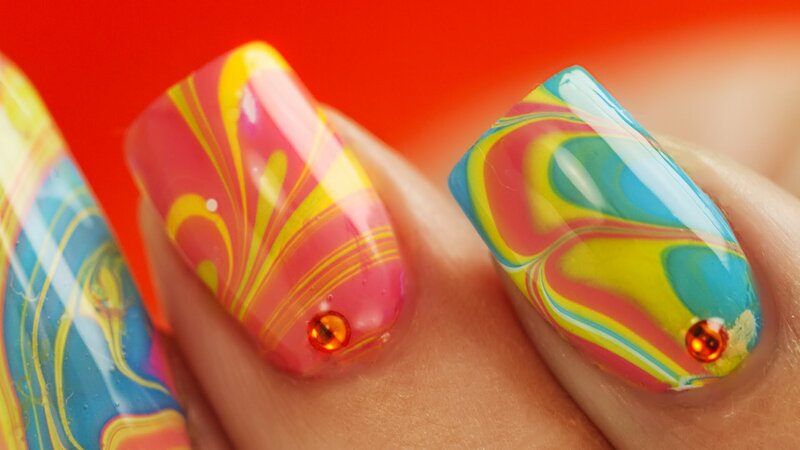 To be able to achieve perfection while drawing geometrical designs on your nails can be quite an art. But, trust is, it is completely doable at home. How? Just make use of a scotch tape. There are several nail art hacks that can be tried while drawing a zig-zag or a pentagon or a simple triangle. 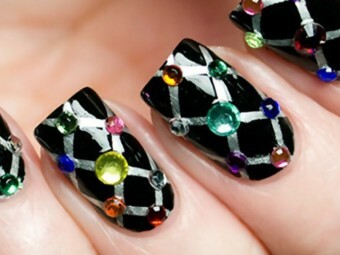 Geometrical nail art patterns are simple yet stylish. On of the easiest nail art design in the world of nail art designs. 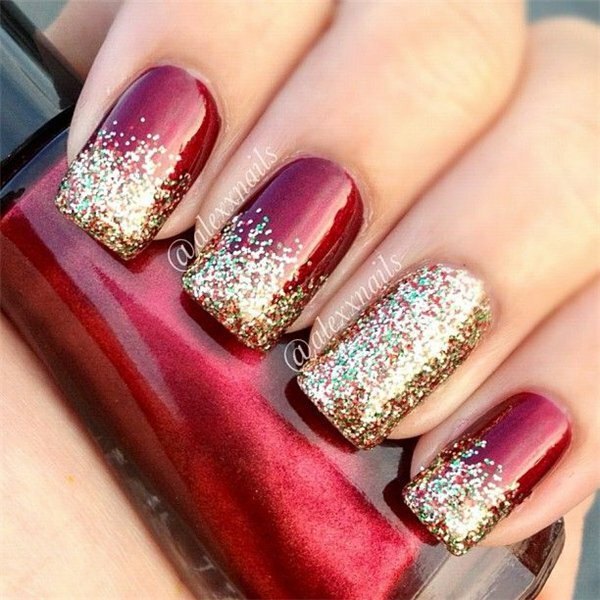 All you need is to make sure that the color of the base coat and that of the glitter are complimenting each other. Just throw in some gold or silver dust on the fingernails to add glamour to the existing appearance. The simplest way to get glittery nail art is to apply any nail polish and apply glitter as a top coat. This one is slightly complex but once you have become a pro at achieving just the right marbling effect on your fingernails, then this can be your go-to style. 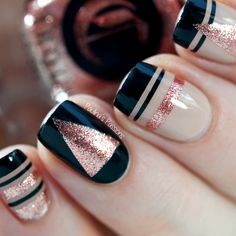 The effect of this nail art design is very chic and retro, but you pretty much need to apply the same steps as you did for marbling to have your nails look like they are freshly tied-and-dyed. Make sure to have enough scotch tape, toothpicks/ needles, paper towels. t can be quite tricky and messy at the same time.